We have two styles of bottle bags with distinct purposes and materials. 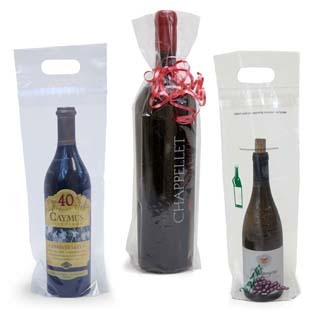 Wine Bottle Gift Bags are a popular choice as gift bags for vineyards and wine stores. Clear and pre-printed Wine To Go Bags are perfect to offer restaurant patrons for taking home partially consumed bottles of wine in a tamper-proof to go bags so as not to be in violation of open container laws.